Where did the original idea for "Awaiting Identification" come from? Why Detroit? Back in 1999, I came across an article in the Detroit Free Press that chronicled the vast, alarming number of unidentified bodies that show up in the Wayne County Morgue each year. I was astounded and saddened by this stark reality. I became obsessed with wanting to figure out who these people were and the circumstances that led to them to end up being unidentified and unclaimed. These were human beings that were born into this world, with feelings, desires, and dreams. I realized in my own small way, through the lens of fiction, I could attempt to bring some of these lost souls back to life. The setting was a matter of convenience, having grown up right outside of Detroit and with a deep appreciation of Detroit culture and history, the good, the bad, and the ugly. Detroit’s influence throughout the world is profound (the $5 work day, cars, music, politics. etc.). Martin Luther King Jr. even delivered what was essentially a rehearsal for his “I Have a Dream” speech at a church in Detroit. In Awaiting Identification, the city is more than a setting; it is more of a character unto itself, just as Ukraine in my first book, Love & Vodka: My Surreal Adventures in Ukraine, played an important role in terms of how it shaped and influenced the main characters. Also like Love & Vodka, Awaiting Identification started out as a screenplay, written with two separate collaborators. The overall storylines of the five characters have remained essentially the same since their creation in 1999. I also found a way to incorporate characters from a short story I had written called “Steve’s Place,” which was originally a short film based on a bar of the same name. I was able to resurrect the real-life owner of this somewhat surreal dive bar, who passed away a couple of years ago. This was one of the advantages of changing the time period from the present day to 1999. The synopsis states: “Like the city in which it takes place, Awaiting Identification is a story of hope, identity, and above all, redemption.” Can you elaborate? “We hope for better things” and “It will rise from the ashes”. Detroit is constantly finding its way out of the ashes, so to speak, whether through fire, rebellion, social or economic hardship. It always finds a way to fight and survive, mostly from sheer necessity. Detroit receives a lot of negative press, but people often fail to reflect on the reasons and causes for the city’s struggles. More recently, Detroit has actually received a fair amount of positive press, with the spotlight on the rapid pace of change and development of the downtown area. Though many view this as progress, many also feel threatened and diminished by the large degree of gentrification—which is the other side of the coin. There is a level of disenfranchisement as perceived outsiders move in to take advantage of cheaper rent. Sure, it’s great that downtown is getting a facelift, but surrounding neighborhoods feel like they are getting the short end of the stick, particularly when it comes to basic necessities such as schools, street lights, waste management, and emergency services. Despite the gritty nature of Awaiting Identification, I hope what people take away from my book is a sense of humanity and light shining through the darkness. The key theme, I think, is redemption, particularly in terms of my five main characters. Despite the fact that we find out they are deceased on page one, I like to think that each of the characters find themselves better off spiritually at the end than in the beginning. Why is the book set in 1999? The time period was a more recent addition to the book. Even though I started writing Awaiting Identification in 1999, I always imagined it to be set in present-day Detroit. However, with the amount of time that has passed, 1999 made sense for a variety of reasons. It was still the heyday of Detroit techno. St. Andrew’s Hall, which figures prominently, was still running “Three Floors of Fun” (check out this article on “America’s Craziest Club: Detroit’s St. Andrew’s Hall” from Spin) and the Detroit I captured seems more from that time period than the present. For one thing, downtown Detroit has gone through a remarkable transformation over the last decade. Also, there was something symbolic about setting the book on the cusp of the new millennium. It fits well with the end-times/redemptive theme running throughout. There is also the symbolic closing of Tiger Stadium a month before the story takes place, which I feel adds another level of symbolic texture. Setting the book on October 30 was by design. Though this date doesn’t hold much national significance, in Detroit, it was infamously known, particularly in the 80’s and into the mid-90’s, as “Devil’s Night.” This was essentially an excuse for arson in the name of fun and mischief, burning down abandoned structures, and, as was too often the case, properties not abandoned at all. Sadly, there were often fatal consequences. In 1995, city officials organized and created “Angels’ Night,” with ten of thousands of volunteers gathering to patrol neighborhoods in the city. Even though Devil’s Night was renamed Angels’ Night in 1995, the characters in Awaiting Identification, in 1999, still refer to October 30 as Devil’s Night. Old habits die hard. Like children, it would be difficult to pick a favorite. However, I will say that I always admired Cat Man’s energy and spirit. Despite being homeless, he appears so carefree and happy. It puts everything in perspective. His storyline is also the most upbeat and positive, which is why I chose Cat Man’s story as the final chapter. I always thought of Cat Man as the heart of the novel, whereas NYC Girl is the soul. NYC Girl is also the only female character, but she is without doubt the toughest of the bunch. What influences did you draw upon when writing “Awaiting Identification”? I would have to say that late night drives through the nooks and crannies of Detroit over the years inspired me as much as anything else over the years, accompanied by Detroit techno music. Techno plays a vital role and has tremendous influence in terms of the minimalist flow to the story. I also listened to Detroit techno, along with Eminem, through most of the writing process. On the writing side of things, novels like Dreiser’s An American Tragedy, Let the Great World Spin by Colum McCann and Jennifer Egan’s A Visit from the Goon Squad. On a filmmaking level, I would say David Lynch, the Coen Brothers, Tarantino, and Barry Jenkins’ Moonlight, which is a great example of minimalist restraint and character development. It served as a good reminder of the power of less is more. Moonlight places no judgment on the characters. It just lets them be. This has always been my intent with Awaiting Identification and I hope I achieved that. I could see “Awaiting Identification” as a TV anthology series. As a screenplay writer, did you have this in mind when writing the book? Film still is and will always be my primary passion. As much as I love writing books, it can never edge out my love for film. Some of the best filmmaking right now is actually on television, thanks to cable TV and streaming services like Netflix, Amazon, and Hulu. 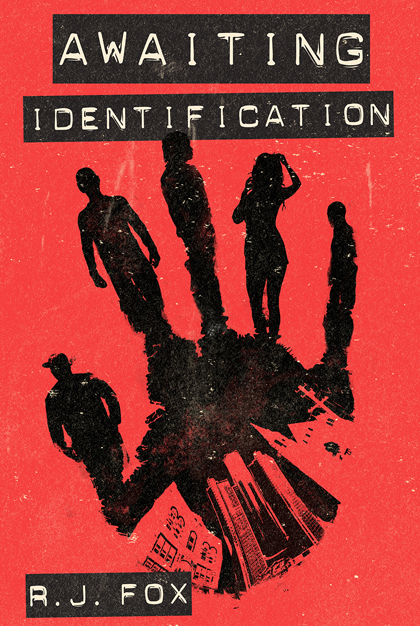 So yes, I would love to see Awaiting Identification as a feature film, but even more ideally as an anthology series. I initially wrote Awaiting Identification as a script, first with my friend Josh St. John and subsequently with my friend Louis Kerman. I owe the existence of these characters and storylines as much to Josh and Louis as to myself. I also flirted with the idea of turning Awaiting Identification into a graphic novel and am still hoping to have an artwork component to complement the book, to bring some of the locations to visual life. The most notable difference between the screenplay and the book is that the original script cut back and forth between all five storylines throughout. With the book, I decided to go character by character and then circle back later to each character as the story progresses in a way that makes narrative sense. Reducing the amount of back and forth allows each character more breathing room and provides readers with an opportunity to really get into the mind of each character, so that they each get their own spotlight so to speak. What I envision with an Awaiting Identification adaptation is an anthology TV series, with each season being set in a new location with a new group of unidentified bodies to explore. That is my ultimate dream. How important of a role does music play in "Awaiting Identification"? The soundtrack to the creation of this book consisted almost entirely of Detroit techno legends, particularly Carl Craig, Plastikman, Jeff Mills, Derrick May, Juan Atkins, and Kevin Saunderson, along with dozens of others, including Moby, who acknowledges the impact Detroit techno has had on his music. In fact, Moby’s music played a significant role in the creation of Love & Vodka. One of the five main characters—Leaf Man—is a DJ who dreams of earning his place among the legends of Detroit techno. Leaf Man’s eclectic taste in music has allowed me introduce classical music, jazz, soul, classic rock, and Motown into the story, as well as exploring the links between electronic music pioneers such as Kraftwerk, Detroit techno, and Hacienda-era Manchester, England with the likes of A Guy Called Gerald, as well as Manchester’s most famous sons, New Order—the latter being a tip of the hat to my publisher who grew up in Manchester. If "Awaiting Identification" was to become a movie or TV series, who could you see playing the main characters? This is a tricky question for several reasons. For one thing, even though the ethnicity of certain characters is implied, it certainly isn’t mandatory. For example, Leaf Man could just as easily be black or white. It’s about finding someone who could capture the soul and essence of each character beneath the surface of race. The pale, emaciated Zealot, however, would almost definitely have to be white. And very creepy. Though I try not to pass judgment on the characters in this book, he certainly doesn’t help himself through his actions. Then again, his tragic back story sheds some light on his motives, as skewed as they may be. In a nutshell, I feel that this particular story would be served with actors who are relatively unknown, if even known at all—literally awaiting identification.